Visible crew/equipment: When the lone Huey helicopter comes to rescue Jack Ryan from a roof top, the reflection of the filming helicopter can be seen in its window. Continuity mistake: At the end, when Jack Ryan is arguing with the President, his "A" tag switches from being over the lapel of his jacket to under it, without him moving. Revealing mistake: When Jack Ryan goes to Ernesto Escabeda's residence and asks to see Ernesto, as he is led up to the house we see his two companions on a roof top ledge watching through binoculars and one of them says "He's in", if you look at that shot closely the suppressor on the mp5 laying next to the sniper is fitted at a decidedly wonky looking angle. Trivia: The Oval Office set from the movie "Dave" was reused for this film, with minor modifications. Trivia: There is a scene where Harrison Ford compares the Colombian and Mexican food, and he finishes saying "I hate Mexican food". In the version of the movie dubbed to Spanish this phrase is changed to "American food, junk food". This happens because this movie was dubbed in Mexico. 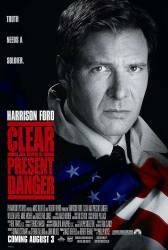 Trivia: The script was written simultaneously with the script for "Patriot Games" (1992). Jack Ryan: Who authorized this? Ritter: I'm sure they'll ask you that. Jack Ryan: Who authorized it? Ritter: I have no recollection, Senator. The President: So go down there, establish it. Jack Ryan: Go down where?